The main purpose of this chapter is to introduce Viktor Frankl’s logotherapy to the 21st century, especially to positive psychologists interested in meaning research and applications. Frankl’s radically positive message of re-humanizing psychotherapy is much needed in the current technological culture. More specifically, I explain the basic assumptions of logotherapy and translate them into a testable meaning-seeking model to facilitate meaning research and intervention. This model consists of five hypotheses: (1) The Self-Transcendence Hypothesis: The will to meaning is a spiritual and primary motivation for self-transcendence; thus, it predicts that spiritual pathways (e.g., spiritual care, self-transcendence) will enhance meaning in life and well-being, even when other pathways to well-being are not available. (2) The Ultimate Meaning Hypothesis: It predicts that belief in the intrinsic meaning and value of life, regardless of circumstances, is more functional than alternative global beliefs. It also predicts that belief in ultimate meaning facilitates the discovery of meaning of the moment. (3) The Meaning Mindset Hypothesis: A meaning mindset, as compared to the success mindset, leads to greater meaningfulness, compassion, moral excellence, eudaemonic happiness and resilience. (4) The Freedom of Will Hypothesis: People who believe in the inherent human capacity for freedom and responsibility, regardless of circumstances, will show higher autonomy and authenticity than those without such beliefs. (5) The Value Hypothesis of Discovering Meaning: Meaning is more likely to be discovered through creative, experiential and attitudinal values that are motivated by self-transcendence rather than by self-interest. Together, they capture the complexity and centrality of meaning seeking in healing and well-being. In sum, Viktor Frankl emphasizes the need for a radical shift from self-focus to meaning-focus as the most promising way to lift up individuals from the dark pit of despair to a higher ground of flourishing. This chapter outlines the differences between logotherapy and positive psychology and suggests future research to bridge these two parallel fields of study for the benefit of psychology and society. In recent years, there has been growing interest in meaning research. In addition to the numerous journal articles on meaning (e.g., Reker & Woo, 2011; Steger, Oishi, & Kashdan, 2009), there are several books related to the topic of meaning (Batthyany, 2011; Hicks & Routledge, 2013; Markman, Proulx, & Lindberg, 2013; Shaver & Mikuliner, 2012; Wong, 2012a; Wong, Thompson, & Wong, 2013). Regardless of one’s theoretical stripes, there is consensus that meaning matters for well-being. However, in spite of the central role of meaning, we still do not have a comprehensive theoretical framework that is capable of incorporating most of the empirical findings on meaning research and logotherapy (Frankl, 1985, 1986). There are already two edited volumes by Alexander Batthyany and associates (2005, 2009) on research relevant to logotherapy, but these publications have received scant attention from positive psychology researchers. My own research on meaning, inspired by Viktor Frankl, has demonstrated that meaning is necessary for healing (Wong, 2010a), resilience (Wong & Wong, 2012), optimism (Wong, 2009a) and well-being (Wong, 2014), thus demonstrating the feasibility of connecting logotherapy with mainstream psychology. This chapter represents a more systematic and comprehensive way to translate Viktor Frankl’s key assumptions and constructs into testable hypotheses. Although both logotherapy and positive psychology are concerned with how to live a meaningful life, they seem to function in parallel universes, divided by vast differences in language, worldviews and values. Such a divide makes integration between logotherapy and positive psychology a daunting task. Though positive psychologists do make an occasional reference to Frankl in connection with meaning research (e.g., Steger, Sheline, Merriman, & Kashdan, 2013), they rarely bother to find out exactly what Frankl has to say or what research has been done on logotherapy. I believe that positive psychology’s research on meaning can be greatly enriched and broadened by a deep understanding of Frankl’s logotherapy and profound insights. Likewise, logotherapists can benefit from learning more about the empirical findings of positive psychology research on meaning. I emphasize Viktor Frankl’s approach for three reasons. Firstly, he was the first significant pioneer in restoring spirituality and meaning to psychotherapy. This is particularly important in an increasingly dehumanized, technological culture. Secondly, he was the first psychotherapist who made the will to meaning, self-transcendence and responsibility the primary therapeutic objectives, which have been largely ignored by mainstream psychotherapists. Thirdly, I believe that his positive message will complement positive psychology in restoring hope and purpose to all those who are struggling in the negative territories of life. Frankl’s logotherapy deserves special attention, because he has shown that the uniquely human motivation of “will to meaning” is not only a promising antidote to many mental health issues, such as depression, violence and addiction, but also provides a complete blueprint for living and dying well. According to Frankl, a clear sense of meaning and purpose can add something positive and significant to one’s life regardless of one’s circumstances and health conditions—a claim that has already received considerable empirical support (e.g., Wong, 1998, 2012a). Viktor Frankl was part of the first wave of positive psychologists, along with Maslow, Rogers and May, who believed in the human potential for personal growth. Frankl was unique in that he developed a lofty and noble view of what is right and good with human beings in spite of his immense suffering in Nazi concentration camps. His personal experiences lent credence to the basic tenets of logotherapy, which were tested and found valid even amid all the dark forces in human existence. The nature of his approach differs from positive psychology because Frankl embraced both the bright and dark sides of human existence and believed that inevitable human suffering could contribute to human achievement and meaning in life (Frankl, 1985). Positive psychology, on the other hand, initially shunned suffering as a legitimate topic; more recently, however, Kashdan & Ciarrochi (2013) began to address the inevitability of suffering as part of the human experience. The most amazing aspect of Viktor Frankl’s logotherapy is that he was able to descend into hell, confront the dark abyss and come out victorious and proclaiming the glorious and noble vision of a meaning-based fulfilling life. He exemplified the hero’s journey as described by Joseph Campbell (1949/2008). It is also noteworthy that Viktor Frankl’s logotherapy was first developed before the 1930s, after the devastating First World War and the collapse of the monarchy. While he was still a medical student, he applied logotherapy to help high school students struggling with suicidal ideation in Vienna, because of the high suicide rate of this demographic. At the time of his medical school graduation, he had been able to reduce this suicide rate to zero, thus he was able to establish a reputation for his work in Vienna (Batthyany, 2005). Another contributing factor was the concept of the “man machine,” which had been prevalent since the industrial revolution. The dehumanization of individuals as machines resulted in many psychological and social problems such as boredom, alienation, addiction and abuse. Viktor Frankl’s recognition of freedom of will and the human spirit reflects his philosophical position that human beings, unlike animals or machines, have the capacity to rise above the macro social forces of industrialization and freely pursue their own interests and dreams in order to endow their lives with significance and purpose (E. Marshall, personal communication, February 21, 2013). Frankl was able to put the basic tenets of logotherapy to empirical test through his experiences at the Nazi concentration camps. Frankl experienced firsthand the absurdity, randomness and meaninglessness of life; he knew firsthand that fate can intervene with one’s normal life and horrible tragedies can strike without reason or warning. Through his personal struggle in four Nazi concentration camps, he discovered that he could still say “Yes” to life no matter what. Logotherapy became widely accepted during an era of meaning crisis caused by the Second World War and the collapse of traditional values (Fabry, 1994; Graber, 2004). According to Frankl, to survive the dehumanization of industrialization and the Nazi concentration camps required a defiant human spirit. An example of such defiance was demonstrated in the Polish rebellion and the French resistance, in which many freedom fighters gave their lives. Although they did not survive physically, their moral courage and defiant human spirit had the survival value of empowering others to rise above suffering and pursue a cause greater than themselves. They exercised their freedom of will; they chose to stand up and fight rather than be slaughtered like helpless animals. They had found something worth fighting and dying for; in so doing, they filled their lives with meaning. A better understanding of the socio-political milieu in which logotherapy was first developed and tested allows one to better appreciate Frankl’s genius of transforming terrible experiences of suffering into powerful concepts that ennoble the human spirit and empower people to survive. In a strange way, Frankl’s message seems relevant again in the 21st century, when many people are struggling with such problems as international terrorism, random acts of violence, depression, addiction and the dehumanization of an increasingly technological culture. We may benefit by paying more attention to Frankl’s logotherapy, which represents his attempt to re-humanize psychotherapy. He provides us with a spiritually oriented blueprint for a better future for humanity. It is difficult to do laboratory experiments to test Frankl’s ideas because no research ethics board would ever approve research projects that subject people to the horrible deprivations and suffering required to prove that only those who are motivated by the will to meaning will survive and flourish. However, Frankl’s detailed autobiographical description of his own experience in Nazi camps provides empirical support for the basic ideas of logotherapy, especially the importance of self-transcendence. Such empirical support, although historical and phenomenological in nature, is no less valid than a typical, artificial experimental manipulation in social psychology research. Furthermore, his basic ideas resonate with the age-old wisdoms of Taoism and Stoicism. Given the increasing evidence of the lack of replicability of some social psychology findings (e.g., Bartlett, 2013), it may be wise to place more trust in time-tested wisdoms and values, as suggested by Frankl. In spite of this cautionary note, there is still value in rigorous research that is based on well-developed measurement instruments and clearly defined and valid constructs. The meaning-seeking model that I have developed here is intended to facilitate such empirical research. To the extent that this model is based on my understanding and interpretation of Frankl’s will to meaning, this model may also be referred to as Frankl-Wong’s Meaning-seeking model. In contrast to logotherapy, contemporary positive psychology, launched in 1998 by Martin Seligman, was developed during a time of peace and prosperity. Positive psychology initially focused only on the bright side of human existence; I called it positive psychology 1.0 (Kashdan & Ciarrochi, 2013; Wong, 2011). Recently, I and others (Sheldon, Kashdan, & Steger, 2011; Wong, 2011) have been emphasizing that a balanced positive psychology 2.0 will confront life in its totality, considering both the positive potential of negatives as well as the negative potential of positives. 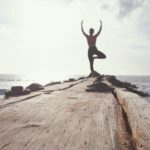 The current stance of positive psychology 2.0 corrects the initial positive bias, but still maintains a positive focus even in negative situations. The ability to take negativity in stride and roll with the punches can reduce a great deal of the stress that is so prevalent in modern life. Furthermore, the uniquely human characteristics of meaning seeking and meaning making enable people to transform toxic viruses of the mind into virtues. 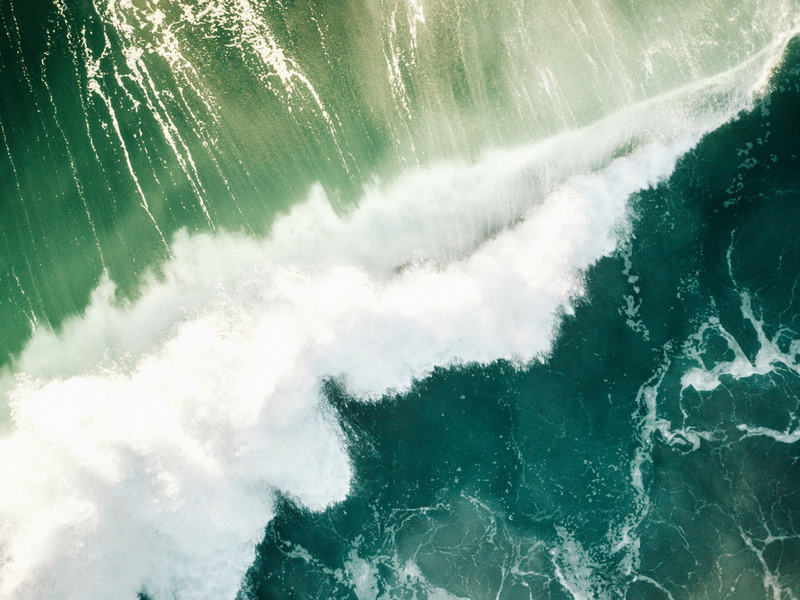 For most clinicians, one of the major challenges is how to equip clients to face the storms of life with equanimity and hope and how to transform negatives into positives. Frankl’s meaning-seeking model provides a theoretical framework for such a balanced positive psychology. Although Frankl’s logotherapy emerged from discovering meaning in suffering, his basic concepts and his overall positive vision of humanity are very much concerned with the existential challenges of how to become fully human through self-transcendence. In various writings, I have attempted to clarify and expand Frankl’s logotherapy and incorporate positive psychology research. I have branded this integrative approach Existential Positive Psychology (Wong, 2009b, 2010b) and meaning-centered therapy (e.g., Wong, 2010a, 2012b). This paper represents my continued effort to bridge Frankl’s logotherapy and positive psychology, with respect to the vital role of meaning in well-being. Contemporary positive psychology has identified meaning as a major research topic. Meaning is one of the key components in Seligman’s theory of Authentic Happiness (2002). A meaningful life is more important than a pleasant life in relating to well-being and the “heart virtues” (Peterson, Ruch, Beermann, Park, & Seligman, 2007). Meaning is also included in Seligman’s (2011) latest five-component model of well-being, PERMA: positive emotion, engagement, relationship, meaning and accomplishment. Peterson (2013) considered meaningful work, love, play and service to be the major domains of the good life. Though these models recognize that meaning is important, their happiness-oriented conception of meaning prevents us from understanding that the pursuit of meaning might clash with the pursuit of happiness (e.g., Baumeister, Vohs, Aaker, & Garbinsky, in press). A clear example of this clash is that parenting can result in less subjective life satisfaction, but higher meaning (e.g., Rizzo, Schiffrin, & Liss, 2012). There are several research findings that indicate that the search for meaning is negatively correlated with well-being but positively correlated with depression and anxiety (e.g., Schulenberg, 2004; Wong 2012a). To define meaning as serving something bigger than oneself (Seligman, 2002, 2011) implies that a meaningful life inescapably entails transcending self-interest in order to serve a greater cause. Interestingly, most positive psychologists do not realize that to make the pursuit of happiness and well-being one’s basic life orientation seems at odds with the basic orientation of meaning and self-transcendence. Positive psychology models of well-being have a limited view of meaning, which actually hinders a fuller understanding of the pervasive role of meaning in human affairs. Steger (2012) and his associates (e.g., 2005, 2008, 2009) have been most active in conducting research on search for meaning. Steger’s Meaning in Life Questionnaire (MLQ; Steger, Frazier, Oishi, & Kaler, 2006) measures both the presence of meaning and the search for meaning in two separate subscales. The presence of meaning refers to the perceived presence of meaning and purpose in one’s life, while the search for meaning refers to the process of seeking meaning and purpose. MLQ has become the standard instrument to use in meaning research. However, a main limitation of MLQ is that it measures meaning as an abstract concept without considering the context of what constitutes presence of meaning and what kind of search for meaning is being measured. The lack of content and context in Steger’s Search for Meaning subscale presents some problems. It makes a big difference whether people are searching for something self-transcending or whether they are searching for pleasure and success as their life goals. Just searching for purpose does not differentiate between these two very basic life orientations. It is also unclear what a low rating score for Search for Meaning indicates, because it has three potential meanings: (1) it is due to being existentially indifferent (Schnell, 2009, 2010), (2) one has just begun to search for one’s own path, or (3) one has already found one’s calling and mission in life and therefore has stopped the search (Wong, 2012c). This lack of content may explain why, based on available research on the MLQ, the relationship between Search for Meaning and well-being is all over the map, ranging from negative correlations to positive correlations to no relationship (e.g., Wong, 2012a). Recent research by Park, Park and Peterson (2010) helped clarify the picture somewhat in their findings that only people who score high in Presence of Meaning enjoy a positive relationship between Search for Meaning and well-being. One possible interpretation is that those who have already found meaning in life may continue to seek a deeper understanding of life, whereas people without the presence of meaning may be struggling with their existential frustration in finding a life goal or purpose; their search for meaning, therefore, may be negatively related to well-being. The above research clearly demonstrates the importance of meaning in well-being. However, most of the research on the positive psychology of meaning lacks a coherent and comprehensive theoretical framework. Additionally, most of the research measures meaning and well-being in the abstract. 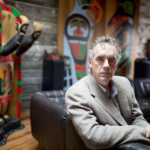 Most recently, Peterson (2012) recognized that we need to pay more attention to the content and origins of meaning—what really matters in people’s lives. I propose that in order to advance meaning research and applications, we need to have a deeper understanding of both the nature of meaning and meaning seeking based on Viktor Frankl’s profound insights on meaning seeking. According to Metz (2013), most philosophers these days think of meaning as a matter of rational pursuit of the good, the true and the beautiful. However, a rational approach would have some difficulty explaining the irrational behaviour of suffering and dying for these ideals. For example, the brave individuals who sacrificially devoted their lives to such pursuits, such as Van Gogh and Gandhi, were considered by their contemporaries to be out of their mind, irrational. From a spiritual perspective, Frankl maintains that, whether one believes in God or a higher power, all people are endowed with a spiritual nature that yearns for beauty, goodness, truth and self-transcendence. The differences between rational and theistic explanations of self-transcendence can only be settled through conceptual analysis and empirical research. We cannot understand Frankl’s logotherapy without understanding his hypothesis about the noetic or spiritual dimension; this dimension is key to logotherapy. “The term [noetic] is taken from the Greek noös or mind. But Frankl uses the term to include everything that is specifically human” (Fabry, 1994, p. 18).This noetic dimension is Frankl’s way of capturing what is right about people and what is distinct about human beings. This noetic dimension goes beyond the meaning perspective of spirituality and religion proposed by Park (e.g., Park, 2005, 2007), Emmons (e.g., 2005) and Pargament (e.g., 1997) and associates (e.g., 2005). Frankl emphasized that spirituality is the part of human nature that separates us from other animals. Spirituality is expressed in the human propensity toward self-transcendence and seeking understanding of the big questions. In other words, humans are by nature meaning focused—motivated by the desire to understand the world in which we live and to search for something out there that demands our devotion. This noetic dimension is Frankl’s way of capturing what is right about people and what is distinct about human beings. This noetic dimension goes beyond the meaning perspective of spirituality and religion proposed by Park (e.g., Park, 2005, 2007), Emmons (e.g., 2005) and Pargament (e.g., 1997) and associates (e.g., 2005). Frankl emphasized that spirituality is the part of human nature that separates us from other animals. Spirituality is expressed in the human propensity toward self-transcendence and seeking understanding of the big questions. In other words, humans are by nature meaning focused—motivated by the desire to understand the world in which we live and to search for something out there that demands our devotion. The noetic dimension represents the common denominator of spiritual traditions and people’s natural tendencies to cry out to the Ultimate Rescuer or pray for God’s help. There was an old saying during the First World War that there are no atheists in fox holes. In traditional China, people used to cry out to heaven (the sky god) for help when they were in desperate situations. Frankl’s emphasis on spirituality as an inherent part of human nature also has a long and venerable tradition in psychology; it goes back to William James (1902/1997). His book, The Varieties of Religious Experiences, continues to impact psychology. In philosophy, interest in spirituality can be traced back even earlier (e.g., Kierkegaard, Pascal). Believing that human beings have a spiritual core with an innate need for meaning. In other words, the innermost core of the “self” is spiritual. It is this spiritual dimension of human beings, not just their need for information and understanding, that is the primary source of meaning seeking. It is this spiritual and motivational emphasis on meaning seeking that makes us truly human. We seek meaning because we are spiritual beings. The will to meaning is another way of saying that we have the spiritual need to seek self-transcendence. Believing that there is coherence and order in the world. Seeking to gain a better understanding of ultimate meaning helps us to understand both the spiritual dimension of who we are as human beings as well as the responsible action/reaction in each situation. According to Frankl, comprehension goes beyond understanding everyday situations; it involves our attempt to grasp the big picture as well as our social responsibility. Believing that there is meaning potential in each situation. The meaning demand of each situation is that we respond to it with the right attitude or action, according to enduring values, intuitive conscience and our partial knowledge of the ultimate meaning (according to Frankl, the ultimate meaning can only be approximated but never fully known). Thus, according to Frankl, what is right and good about human beings is their spiritual nature as reflected in these qualities. This provocative assumption is open for psychologists and neuroscientists to examine. Meaning is universal in terms of its spiritual origin, but the expression and experience of meaning are culturally based (Baumeister, 2005; Baumeister, Vohs, Aaker, & Garbinsky, in press). To the extent that religion and spirituality are universal among all cultures, spirituality may be hardwired. The recent book on why God does not go away (D’Aquili, Rause, & Newberg, 2002) and other books (e.g., Newberg & Waldman, 2007) by neuroscientists provide further evidence that spirituality is part of human nature. Park (2007) regards religion and spirituality as meaning systems. In contrast, Frankl considers meaning seeking as stemming from one’s spiritual nature. According to Frankl, meaning, compassion and other positive psychological resources belong to the spiritual dimension. This hypothesis has important research and application implications. For example, this hypothesis suggests that the best way to bring out these spiritual qualities and facilitate personal transformation is through spiritual lessons or meaning-oriented therapies rather than simple positive activities (e.g., Lyubomirsky & Layous, 2013) or strength-enhancing activities (e.g., Peterson & Seligman, 2004). According to this hypothesis, we can also predict that those who are spiritually oriented or attuned will score high in positive psychological resources compared to those who are spiritually disinterested. To Frankl, spirituality is inherently connected with body and mind in the search and discovery of meaning through creative, experiential and attitudinal values. It is an embodied spirituality, which involves body sensations, movements and creative activities.I now proceed to reformulate Frankl’s basic assumptions into testable hypotheses to facilitate scientific research. The three basic assumptions of logotherapy are: the will to meaning, meaning of life and freedom of choice. I now proceed to reformulate Frankl’s basic assumptions into testable hypotheses to facilitate scientific research. The three basic assumptions of logotherapy are: the will to meaning, meaning of life and freedom of choice. Distinguished from Freud’s will to pleasure and Nietzsche and Adler’s will to power, the will to meaning is perhaps the most important contribution of Viktor Frankl. This concept is nothing short of revolutionary in terms of its scope and depth. Although Ernest Becker (1962) in his book, The Birth and Death of Meaning, expresses similar ideas, only Frankl makes the will to meaning the main thrust of logotherapy. First of all, Frankl recognizes the will to meaning as a primary and universal human motivation. He also recognizes that this primary motivation may lie latent in the unconscious. When people are preoccupied with the pursuit of happiness and success as substitutes for meaning and spirituality, their noetic needs are pushed to the unconscious until they encounter a meaning crisis (e.g., Schnell, 2010). Erich Fromm, an existential psychoanalyst, also recognizes the human being’s deep-seated quest for existential meaning: “All passions and strivings of man are attempts to find an answer to his existence” (Fromm, 1956, p. 27). The will to meaning represents the most important noetic need. “In logotherapy the pursuit of meaning is more than an inalienable right—it is the essence of humanness. If we repress it, we open up in ourselves the infernal pit of the existential vacuum.” (Fabry, 1994, p. 79). The Unheard Cry for Meaning (Frankl, 1978/2011), which may come from the unconscious mind, represents a fundamental spiritual yearning. According to the spirituality hypothesis above (section I.6), the uniquely human need for self-transcendence is spiritually rooted. We have the spiritual need to seek self-transcendence. Only by responding to this spiritual need can we live as fully functioning human beings. 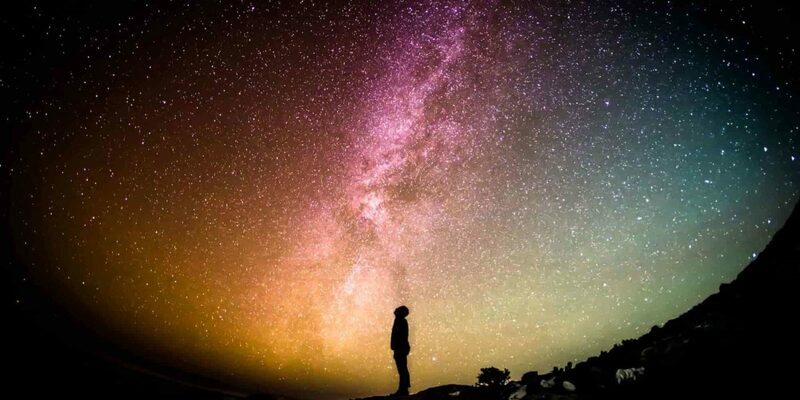 The self-transcendence hypothesis simply predicts that only when we redirect our focus from self-interest to something bigger than and beyond ourselves can we experience meaning in life. Almost all positive psychology researchers would agree on the importance of stepping beyond ourselves to serve something bigger, if we are to experience meaningfulness. Frankl is unique in pinpointing self-transcendence as the hallmark of the spiritual nature and as the end state of becoming fully human: “Only when we lift ourselves in to the dimension of spirit do we become fully human” (Fabry, 1994, p. 19). Furthermore, Frankl emphasizes the altruistic and selfless nature of self-transcendence: “Meaning comes from commitments that transcend personal interests; it comes, as Frankl puts it, from ‘reaching beyond the self toward causes to serve or people to love’” (Fabry, 1994, p. xix). Thus, Frankl elevates commitment to the spiritual act of serving a higher purpose for the greater good. According to Maslow’s revised need hierarchy (Hoffman, 1996; Koltko-Rivera, 2006), self-transcendence sits at the top and follows self-actualization. Different from Maslow, Frankl insists that only in fulfilling the spiritual need for self-transcendence can we find self-actualization. In other words, self-actualization is a by-product of fulfilling our calling to serve the greater good. If we do not switch from self-focus to meaning-focus, we will have difficulty in self-actualization. Frankl’s view flows from his emphasis on the noetic dimension of human nature. When positive psychologists consider the pursuit of something larger than oneself to be instrumental to achieving authentic happiness (Seligman, 2002), they demonstrate a fundamental misunderstanding of the true nature of self-transcendence; doing things for the sake of personal happiness is contrary to the essence of self-transcendence, according to Frankl. Furthermore, recent research by Baumeister, Vohs, Aaker and Garbinsky (in press) has shown that the pursuit of meaningful living may, in the short run, be related to distress and unhappiness. In other words, the will to pursue self-transcendent goals demands the courage and willingness to sacrifice personal happiness and well-being in order to achieve those higher and noble life goals. However, such selfless service, in turn, may bring about greater subjective happiness as an unintended by-product. According to the current self-transcendence hypothesis, the pursuit of something greater than oneself is a terminal value, while the positive psychologists treat it as an instrumental value. Even Seligman’s latest (2012) theory of well-being, PERMA, still considers personal well-being and flourishing to be the final end. Future research needs to explore the differences between these two views of self-transcendence, with respect to meaningfulness, vocational calling and virtues. Recent research on self-transcendence has demonstrated that it is related to well-being (e.g., Coward, 1996; Ellermann & Reed, 2001; Runquist & Reed, 2007) and spirituality (e.g., Emmons, 2005, 2006; Grouzet et al. 2005), especially for the elderly and patients with terminal illnesses (e.g., Burr, Santo, & Pushkar, 2011; Coward & Reed, 1996; Haugan, Rannestad, Hammervold, Garåsen, & Espnes, 2013; Iwamoto, Yamawaki, & Sato, 2011; Matthews & Cook, 2008; McCarthy & Bockweb, 2013; Reker & Woo, 2011). Self-transcendence has become an important topic for spiritual care, especially for the old-old (e.g., Coward & Reed, 1996; Nygren, Jonsén, Gustafson, Norberg, & Lundman, 2005; Reed, 1991). According to Frankl’s meaning-seeking model, the will to meaning and self-transcendence provide the best possible future, not only for individuals, but also for humanity. It predicts that spiritual pathways (e.g., spiritual care, self-transcendence) will enhance meaning in life and well-being, even when other pathways to well-being are not available. It appears that there might be developmental differences; for example, for the old-old and terminal cancer patients, Frankl’s concept of self-transcendence gains increasing importance for well-being as their world shrinks (Coward & Reed, 1996). Central to Frankl’s logotherapy, the will to meaning means that each individual is motivated to discover his or her unique life calling. Jung (1954/1981) expressed a similar idea in his book The Development of Personality. Calling is not just about work and career—it is also about how one responds to life and various situations. One’s life is meaningful to the extent that it is rooted in the belief that one needs to discover one’s purpose in life or raison d’être based on one’s talents and perceived life’s calling. The self-transcendence hypothesis considers vocational calling a major aspect of one’s lifelong calling to serve others. This definition echoes Frankl’s emphasis on self-transcendence. A general sense of calling, regardless of one’s occupation, is the call to devote one’s life to serving others and to improving oneself in order to fulfill one’s potential. A specific sense of calling is to discover a special niche or life role that makes use of one’s unique talents, temperament and experiences. This calling may change according to an individual’s stage of development, station in life and the demands of each situation. For example, during the Second World War, many Chinese students and intellectuals gave up their pens to pick up guns in response to the patriotic calling to serve their homeland. This change in calling is triggered by the demand of changing times and situations. Finding one’s life calling or vocational calling is not an easy task. It may take many trials and errors to discover one’s unique calling, but even the search for it gives one hope and purpose in life. A sense of calling endows one’s life with a sense of meaning, responsibility and dignity. Calling necessarily needs to entail some sense of societal contribution above and beyond personal happiness and success. There is near-consensus that calling is linked to meaning and purpose as well as the betterment of society (Bellah, Madsen, Sullivan, Swidler, & Tipton, 1985; Dik, Byrne, & Steger, 2013; Dik & Duffy, 2009; Hardy, 1990). To separate personal meaning from social responsibility is to make one’s life less meaningful. Even monks in monasteries or scientists in basic research, who appear to live their lives in seclusion, would most likely say that their solitary pursuits are an inherent part of their vision for a better world through prayer, singing and serving together as brothers and sisters. Both Alfred Adler’s (1931/1958) emphasis on social interest and the present growing literature on environmental psychology are examples of the importance of civil responsibility as a main thread of meaningful living. Implicit in Frankl’s meaning-seeking model is the assumption that the person is embedded in a larger context of relationships to other human beings, to the world and to some higher power; personal responsibility includes civil responsibility. More recent research by Duffy and associates (2013) emphasizes the importance of living out a calling as compared to simply perceiving a calling in promoting life satisfaction and well-being. This research reinforces Frankl’s emphasis on self-transcendence as a way of life.Positive psychology research provides evidence that one experiences life as meaningful when one’s calling is to serve some greater good (Hunter, Dik, & Banning, 2010; Seligman, 2002; Steger, Kashdan, & Oishi, 2008). This empirical finding can also be understood by the self-transcendence hypothesis. Research has also shown that a sense of calling in work is related to optimal outcome (Bellah et al., 1985; Dik, Duffy, & Eldridge, 2009; Hall & Chandler, 2005). It seems logical to suggest that a sense of calling in one’s life beyond the work context is also related to life satisfaction and optimal functioning (Frankl, 1985; Seligman & Csikszentmihalyi, 2000). Personal meaning is often linked to a sense of mission and pursuit of calling (Baumeister, 1991; Dobrow, 2006; Hall, & Chandler, 2005; Novak, 1996; Wrzesniewski & Dutton, 2001; Wrzesniewski, McCauley, Rozin, & Schwartz, 1997). Calling is an integral part of one’s self-identity (Dik & Duffy, 2009; Dobrow; Hardy, 1990; Wrzesniewski et al. ); this self-knowledge and self-identity—knowing who one is and what one’s life is all about—is necessary for one’s sense of meaningful living. Conversely, Frankl’s concept of will to meaning implies the global belief that one’s life fits into an orderly and coherent larger scheme of things. Developing such a meaning-mindset may therefore be an effective intervention in increasing sense of calling and meaningfulness. This might sound a bit circular, but it actually refers to a more fundamental intervention of changing people’s mindsets from an orientation toward personal success to one of self-transcendence, from self-focus to meaning-focus. A little-known logic related to self-transcendence is that it demands continual self-improvement if we are to fulfill our full potential. There is no limit to personal growth, at least in the spiritual realm. Therefore, when one is motivated to transcend both external and internal limitations and realize one’s full potential, one is expressing self-transcendence. The vast literature on self-efficacy, competence and the growth mindset can all be reinterpreted in terms of the basic human motivation for self-transcendence. According to Frankl, every life has intrinsic value for two reasons. First, every person has a unique calling. Second, every person has the innate tendency to develop their full human potential, regardless of their circumstances. Whether one is in old age or in the terminal stage of cancer, individuals can still grow spiritually, in terms of meaning, faith, courage, compassion and altruism. Frankl and other logotherapists have provided various examples of those who grew in these areas in spite of their handicaps and suffering (Frankl, 1985, 1986; Marshall & Marshall, 2012). Future research can explore how a growth orientation will enhance meaningfulness and well-being in cancer patients (e.g., Appelbaum et al., 2012; Breitbart et al., 2010; Coward & Kahn, 2005). Self-transcendence is, by definition, intrinsically relational. Vertically, self-transcendence reaches beyond the limits of time and space, to connect with the transcendental realm or to worship and serve the Creator. Throughout his writing, Frankl has made it very clear that his concept of self-transcendence or the Supra-meaning transcends specific religious views and resides in the spiritual nature of being human. Horizontally, self-transcendence transcends ego-concerns and self-interest to serve others. It is intrinsically compassionate and altruistic, given its spiritual nature. In self-transcendence, other people matter in their own right, because of their intrinsic value. Loving our neighbours is its own reward. Showing kindness to strangers is its own reward. We engage in deeds of compassion and kindness because we are simply expressing our spiritual nature. This is fundamentally different from using other people as instruments for our own advancement and happiness. There are basically two fundamentally different perspectives on self-transcendence. Most philosophers in the naturalist camp (e.g., Levy, 2005; Metz, 2011) believe that self-transcendence, along with the pursuit of beauty, truth and goodness, can be explained in rational terms without reference to God. In contrast, the supernatural camp (e.g., Cottingham, 2003, 2008; Frankl, 1985) believes that self-transcendence reflects our spiritual nature to yearn for oneness with God and oneness with others. Frankl is open to both camps. The rational or naturalist approach can explain readily the horizontal relational aspect of self-transcendence but has some difficulty explaining the vertical relational aspect. The advantage of logotherapy is that it hypothesizes a single motivation of self-transcendence based on the spiritual nature of human beings. The assumption of the spiritual nature of self-transcendence has important implications. According to this perspective, any teaching or training that makes people more spiritually inclined should lead to better relationships with people as well as with a Higher Power. Meaning seeking, in this sense, is a never-ending process because it is simply an expression of our spiritual yearning. Meaning of life is the second of Frankl’s basic assumptions. If you hypothesize that people have an innate need for the will to meaning, logically, you also have to hypothesize that meaning can be found to meet that need, even when life seems totally cruel and absurd, as in the Nazi concentration camps or war-ravaged countries. Simply clinging to the belief that life has intrinsic meaning no matter what can be very helpful in coping with trauma. Frankl recognizes both the search for ultimate meaning and the search for situational meaning. While Frankl acknowledged that ultimate meaning is beyond human comprehension and unknowable, the global belief that there is ultimate meaning and purpose in life, in spite of all the chaos and absurdity, predisposes people to discover the meaning potential in every passing moment. Belief in the ultimate meaning of life is inherently related to the belief that life has intrinsic meaning and value, regardless of circumstances. Therefore, life is worth living because of this belief. It reminds us of William James’ affirmative statement: “Be not afraid of life. Believe that life is worth living and your belief will help create the fact” (James, 1896, Section IX). William James understood, as Frankl did, the functional benefits of belief in the meaning and value of life. Ultimate meaning is related to such issues as the meaning of suffering, the meaning of self-identity, the meaning of life as a whole and the nature of existence. “The grandiose order, I believe, is what Frankl understands by logos, ultimate meaning. We can never hope to ‘find’ it in its totality, we can only pursue it to the best of our abilities” (Fabry, 1994, p. 35). Self-identity, differing from ultimate meaning, is knowable to a certain extent. However, when we push the concept of self-identity to its limit and ask such questions as, “Where did I come from? Where do I go after death? What is God’s unique calling for my life,” we are venturing into the realm of ultimate meaning. At this level, our search for ultimate meaning is an ongoing process. In a sense, ultimate meaning belongs to the spiritual and transcendental realm. From time to time, we are given a glimpse of the glorious possibility that there is ultimate meaning and purpose in life. However, as we go through different stages of life and different experiences, our understanding evolves. This unending quest for ultimate meaning is simultaneously both uplifting and trying, and it has been at the centre of the human search for meaning since antiquity. Belief in ultimate meaning is a double-edged sword. In most situations, such a global belief is functional and increases people’s sense of hope and purpose. However, in traumatic situations, when this belief is challenged by the bleak reality, these individuals may suffer from shattered assumptions (e.g., Janoff-Bulman, 1992; Park, 2010; Proulx & Inzlicht, 2012; Wong & McDonald, 2002). Once these individuals are able to accommodate the traumatic events and reconstruct their global beliefs, they will adapt better than people who do not believe in ultimate meaning. To the extent that ultimate meaning is located in the noetic dimension, we can also predict that individuals who believe in ultimate meaning will demonstrate the same psychological characteristics of individuals who score high on spirituality or religiosity measures, to the extent that they measure global beliefs rather than specific religious practices. This hypothesis can be derived from the ultimate meaning hypothesis. On a more concrete level, we can fulfill our need for meaning and our existential vacuum by discovering the meaning of each unique situation and moment. “Every situation, every unrepeatable moment, offers a specific meaning potential. To respond to these meaning offerings of the moment is to lead a meaningful life” (Fabry, 1994, p. 37). About this meaning potential, however, “Frankl cautions that we cannot invent meanings arbitrarily; we can only discover the meaning inherent in the situation” (Fabry, p. xvi). We cannot simply make up some meaning for a given situation. Nor can we fully understand the meaning potential by intuition. We need to draw upon our experiences, knowledge, intuitive conscience and courage to relate to the situation in a responsible manner. More importantly, belief in ultimate meaning facilitates the discovery of meaning of the moment. Meaning requires a responsible response to the situation. For example, the lack of responsible action in the bystander phenomenon (e.g., Latane & Darley, 1970) suggests that most people do not respond to help someone in dire need. To reach out and help others demands that we listen to the voice of self-transcendence and intuitive conscience. In other words, to act altruistically in a potentially dangerous situation demonstrates the heuristic of fast thinking based on empathy and compassion (Seppala, 2013; Yaninger, 2013). It may be interesting to test whether the bystander effect can be reduced in people who have been awakened or trained in being attuned to the meaning potential of the situation. The idea that meaning seeking entails hard work may seem contrary to the more recent research by Laura King (2012). According to King, meaning is everywhere and easy to discover. However, her research is focused on the intuitive/cognitive understanding of associative meaning in artificial laboratory situations rather than the significance and meaning potential of everyday situations. Furthermore, the university students that serve as her participants are educated with the scientific worldview that natural phenomena are normally orderly and make sense. In contrast, Frankl focuses on our existential understanding of both the ultimate meaning and situational meaning. Each situation and each moment has potential meaning—a potential emotional, relational and moral significance. It demands not just a rational and intellectual understanding of associative or causal factors, but entails a full-bodied response to the situation—physical, emotional, relational and personal. A case in point is that my wife and I went to a Chinese restaurant together to celebrate Chinese New Year. Consistent with the Chinese tradition, I ordered sesame rice balls in rice wine paste for dessert. As I placed a rice ball in my mouth, it brought back so many happy memories of family New Year’s dinners with lots of laughter and love around the dinner table. Now that my parents and both older brothers are gone, I wish that I had appreciated the significance of this tradition when I was much younger. The key to discovering the meaning potential of the moment is to appreciate the moment before it becomes a memory. This emphasis on being attuned to meaning potential is similar to my emphasis on mindful awareness (e.g., Wong 2012b) and the current popularity of mindfulness in positive psychology (e.g., Kashdan & Ciarrochi, 2013). This hypothesis predicts that the more meaningful moments we have experienced, the greater the level of perceived meaningfulness and life-satisfaction. Situational meaning is influenced by global meaning, according to Park (2010). Similarly, according to Frankl, belief in ultimate meaning facilitates the discovery of situational meaning. Here, we also talk about the uniquely human ability to review our lives and assess the meaning contents of our life as a whole (Frankl, 1990, as cited by Marshall & Marshall, 2012). This level of meaning reflects people’s overall assessment of their life meaning, in terms of their degrees of understanding of ultimate meaning, fulfilling their unique callings and the number of meaningful moments. This level is more concrete than ultimate meaning, but also more abstract than the meaning of each situation. It is this global self-assessment of meaning that is measured by Steger’s MLQ Presence subscale (Steger, Frazier, Oishi, & Kaler, 2006) as well as Wong’s Personal Meaning Profile (PMP; Wong, 1998). Future research will need to measure the three types of meaning separately—ultimate meaning, situational meaning and overall meaning in life—and investigate their different psychological correlates. Remember the heart-warming movie It’s a Wonderful Life? The protagonist did not take his own life at Christmas, as the angel reminded him of all the good things he had done and the individual lives he had touched. Also recall all the lives Frankl was able to save from suicide as a result of his clinical work and writings. What can we say to those who are contemplating suicide? We would predict that the best way to prevent suicide is to appeal to ultimate meaning, situational meaning and future meaning to be fulfilled. This hypothesis is based on the common sense notion that individuals would not take their lives if they recognized they had a reason for living. The potential power of meaning in preventing suicide is worthy of further research. Similarly, for those who are recuperating from major surgery, suffering from terminal illness, or recovering from a major trauma, we can facilitate the healing process through strengthening their will to live through meaning. One of Viktor Frankl’s most important contributions to the psychology of meaning is his idea that the will to meaning requiresa shift of focus from the pursuit of success to the pursuit of meaning fulfillment. To make the pursuit of meaning one’s primary life value is to embrace a meaning mindset (Wong, 2012d). Unfortunately, the significance of this mind-shift has not yet caught the attention of researchers and psychotherapists; it has the potential to transform positive psychology and positive education. 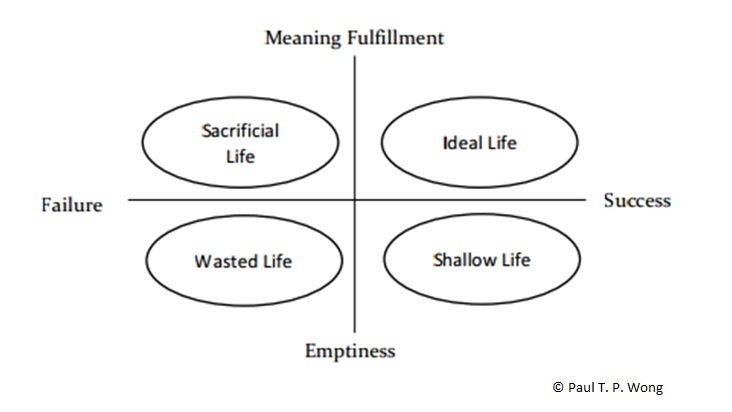 I have captured the relationship between Frankl’s ideas of the meaning-fulfillment and success dimensions in the following figure. The ideal life is characterized by the successful pursuit of one’s ideals and mission. However, even in situations where one is unable to realize one’s vision—because of sickness or external circumstances—one may still feel that one has lived a worthy life because of one’s personal sacrifice for a worthy cause. Society would be better off if we educate children to pursue meaningful contributions toward humanity, rather than pursuing personal happiness and success. All the great humanitarians, such as Albert Schweitzer, Maya Angelou, Oskar Schindler and Mahatma Gandhi, devoted their lives to a noble mission. In contrast, those who pursue money, power and wealth can achieve only a shallow life at best; when they fail in their egotistic goals, they are more likely to become bitter, angry and depressed than those who failed in pursuing a meaningful life (Christensen, 2012; Huffington, 2013; Lyubomirsky’s, 2013). Such a shallow life is a wasted life, because it has squandered the opportunities for personal growth and contribution to humanity. Thus, considering all four quadrants, having a meaning mindset has important implications for personal and communal well-being. The aim of logotherapy is to reorient people’s basic life values from the pursuit of success and happiness to the pursuit of meaning fulfillment and self-transcendence. The former is natural and self-focused, whereas the latter is spiritual and meaning-focused. Often our spiritual need for meaning and self-transcendence is pushed to the unconscious because of our preoccupation with the ego and the flesh. Meaning Therapy is uniquely suited to rescuing individuals from a life of frustration, despair and stress in their often futile attempts to pursue money and power. The practical implications for this meaning fulfillment dimension are both significant and wide-ranging. This hypothesis suggests that it is possible for individuals and society to be transformed; meaningless strife may be turned into harmony, compassion and well-being. Recently, I developed the Life Orientation Scale to measure the meaning mindset as a basic life orientation (Wong, 2012d). At present, no meaning measures are adequate to measure the scope of the will to meaning as conceptualized in the meaning mindset. Crumbaugh and Maholick’s (1964) Purpose in Life (PIL) scale measures the presence of purpose as well as its positive outcomes. More recent research by Morgan and Farsides (2007) as well as Schulenberg and Melton (2010) confirms a two-factor structure of the PIL: exciting life and purposeful life. Crumbaugh (1977) developed the Seeking of Noetic Goals (SONG) inventory as a complement to the PIL as a measure of meaning seeking. The latest research by Schulenberg, Baczwaski and Buchanan (in press) confirms that the SONG also has two factors. The first factor seems to measure dissatisfaction with one’s place in the world and the need for life direction; the second factor seems to measure an existential perspective regarding future achievement. The SONG is clearly future-oriented, primarily measuring the search for ultimate meaning as well as one’s life calling and mission. Steger and associates’ (2006) Meaning in Life Questionnaire (MLQ) Search sub-scale has been criticized earlier in this chapter for its lack of content. As such, the SONG is not an ideal measure of the quest for meaning and purpose. What is needed is a meaning-seeking instrument that captures the three key concepts of Frankl’s meaning-seeking model: (1) understanding the mystery of ultimate meaning; (2) one’s role in the world andone’s motivation or need for realizing one’s unique calling of achieving something significant and transcending self-interest; (3) one’s sense of responsibility to do what is right in response to situational demands. These three subscales would measure both the cognitive and motivational emphases of Frankl’s meaning-seeking model. I believe that my Life Orientation Scale (LOS) can adequately measure the first two aspects of meaning seeking according to Frankl’s logotherapy. The LOS should correlate with SONG scores because they both measure (a) belief in ultimate meaning and (b) the motivation to realize the will to meaning through self-transcendence. The LOS can also be used as a measure of Park’s concept of global meaning. The LOS should predict both High Presence and High Search scores in Steger’s MLQ. We can also predict that scores on the LOS will be positively correlated with measures of compassion, altruism, humanitarianism, universalism, spirituality and the “heart virtues” because they are all from the spiritual core of the human person. The LOS, to the extent that it measures a spiritually oriented value orientation, should also be correlated with spiritual well-being (e.g., Paloutzian & Ellison, 1982) and other indices of spirituality. Frankl’s hypotheses of will to meaning and meaning in life are predicated on the assumption that people have the innate capacity of freedom of will, which includes freedom to adopt certain attitudes. This is Frankl’s third basic assumption. This hypothesis is closely related to self-determination theory (Deci & Ryan, 1985; Ryan & Deci, 2000). Frankl’s hypothesis is that one experiences meaning in life not just because of the will to meaning and the belief of intrinsic meaning in life, but also because one has the capacity of choice to respond to life in a responsible and self-transcendent manner. Frankl’s hypothesis of freedom of will has two important aspects: (a) One always has the freedom of choice, at least in attitude if not in action. Frankl (1985) writes: “everything can be taken from a man but one thing: the last of the human freedoms—to choose one’s attitude in any given set of circumstances, to choose one’s own way” (p. 86); (b) Such freedom does not automatically entitle one to act or respond in an arbitrary, irresponsible way. “We are free if we see ourselves as part of an order and response-able to it. We are unfree if we reject any order” (Fabry, 1994, p. 114). Fabry (1994) also states, “In our surge toward unlimited freedom everything has become possible because everything is permitted and the result is anxiety and emptiness.” (p. 112). Current research has shown that increasing the number of free choices beyond a certain point reduces well-being and increases anxiety (Schwartz, 2012). Therefore, consistent with existential thinking, too much choice can cause anxiety. The self-determination theory emphasizes relatedness, efficacy and autonomy. Frankl’s freedom of will hypothesis would add the additional ethical component of responsibleness. Frankl (1969/1981) warns that “freedom will degenerate into arbitrariness unless it is lived in terms of responsibleness” (p. 49). You are free to respond in any way you want in a free society, but only when you choose to respond in a responsible and self-transcendent way will you experience meaning. It is not a matter of how many free choices you have, but what kind of choice you make. “Our freedom of choice, even in prisons, may lead to either a meaningful or an empty life. To be meaningful… life must be lived freely and responsibly.” (Fabry, 1994, p. 120) To clarify Frankl’s concept of responsibleness, Fabry (1994) wrote: “Responsibility is imposed from the outside; responsibleness is freely chosen.” (p. 120). In his emphasis on responsibility and responsibleness, Frankl seems like a lone voice in the wilderness. In the positive psychology circle, some coaches question the usefulness of the concept of right and wrong; they believe that the important question is whether it works for you or makes you happy. Even positive psychology research has not taken responsibility as an essential component of meaningful living. For example, Kashdan and Ciarrochi (2013) define meaning in terms of purpose and comprehension. Based on ACT (Acceptance and commitment therapy), they also emphasize the importance of the value-action unit in meaningful living. In contrast, Wong’s PURE model (Wong, 2010a) defines meaning as purpose, understanding, responsible action and enjoyment or evaluation. 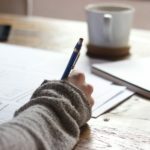 In accordance with logotherapy, which puts a premium on responsible action, Wong emphasizes value-driven and situation-specific, responsible action. If everything goes well, Wong’s purpose-understanding-action unit should result in enjoyment. If not, it will lead to evaluation of this unit. Therefore, PURE appears to be a more complete description of the structure and function of meaning and a more comprehensive meaning-based positive intervention. According to Frankl and Wong, purpose is value laden because it is based on self-transcendence and other enduring values; understanding is based on our comprehension of both ultimate and situational meanings; and response is based on values, conscience and wisdom. Please see Figure 2 for a schematic presentation of the ACT and Meaning Therapy models. Frankl’s main contribution is his insistence on responsibility and values. Frankl took pains to reiterate the point that meaning is discovered rather than made. This reflects his painful experience at the hands of Nazi Germany. If meaning can be made arbitrarily, simply by pursuing a project bigger than oneself, then Hitler could qualify as living a meaningful life. Such a notion would certainly be very offensive to Frankl. At a time when traditional values were crumbling and people could no longer live by the meaning given by traditional authorities such as the church and the culture, they had to discover their own meaning to live by. How could they freely choose their meaning without being purely arbitrary in their choice? In other words, how can we reconcile subjective meaning with objective criteria? Frankl resolved this dilemma by hypothesizing that, while one is free to choose one’s own meaning, it is only when one’s choice is consistent with time-proven values, in a self-transcendent way, that one can experience meaning in life. The creative value captures the importance of doing something in the service of others. This value is not just a matter of doing what one is best at or doing what one loves, as emphasized by our contemporary positive psychologists; our motive matters. Consistent with our prior discussion on calling, we experience meaning only when we make use of our gifts and fulfill our unique calling in contributing to society. Frankl’s concept of the will to meaning emphasizes that “self-actualization, a popular goal in affluent societies, is fulfilling only when it is oriented toward meaning, not pleasure, power and riches. Logotherapy maintains that meaning comes from self-transcendence (to reach out beyond oneself and do things for the sake of others), not from self-actualization” (Fabry, 1995, p. 9). The experiential value focuses on relationships—relating to other people, life and nature with openness and appreciation. This is consistent with the existential theme of being free and open in relating to the world around us. We can find meaning through experiencing beauty, truth and love, if we are spiritually attuned and meaning minded. The experiential value is consistent with the current emphasis on mindfulness (e.g., Kashdan & Ciarrochi, 2013), in how we relate to our daily experiences. To experience meaning means more than making sense of what happens around us and to us—it also means being appreciative and grateful. The third way of finding meaning is attitudinal. This value applies to finding meaning in times of suffering. We can relate to suffering in a positive way by 1) taking a defiant attitude to confront it; 2) finding some important lesson or positive meaning in the negative experience; 3) revising our life goals and global beliefs; 4) making the most of life in spite of suffering; 5) transforming suffering into an opportunity for being a heroic example to others; or 6) transcending suffering by cultivating spirituality. In other words, logotherapy is not designed to teach us how to overcome or escape from suffering; rather it emphasizes a broad range of positive attitudes for relating to unrelievable pain in a courageous manner. Viktor Frankl’s tragic optimism focuses on (a) affirmation of the meaning and value of life, regardless of circumstances; (b) acceptance of what cannot be changed; (c) self-transcendence in serving a higher purpose; (d) faith or trust in God and others; and (e) courage to face adversity (Wong, 2009a). Forsyth (2003) summarizes Frankl’s three values very succinctly: “Work, love and suffering are seen then as the three basic ways of actualizing meaning in a self-transcending way and for Frankl this is a conclusion based on phenomenological analysis rather than moral or philosophical principles” (p. 231). Logotherapy is value-laden. Frankl’s meaning-seeking model emphasizes meaning as both a terminal and instrumental value, an important distinction first made by Rokeach (1973). The will to meaning, self-transcendence and the meaning mindset all emphasize meaningfulness as a terminal value in contrast to the egotistic pursuit of happiness and success as terminal values. The three values of finding meaning are instrumental values. The creative value refers to the personal responsibility of pursuing and practicing the value of self-transcendence and serving the greater good; this encompasses the enduring value of contributing to society, which is shared by philosophical and religious traditions. The experiential value refers to appreciating the truth, kindness and beauty in the world in which we live, especially the relational and natural world; this is similar to Buddhist mindfulness teaching. The attitudinal value refers to finding a positive way to relate to various sources of suffering; this value is also advocated by Stoicism and Taoism among others. In other words, these three time-proven values show us how to discover meaning in our daily lives in a way that makes us more fully human and agents of positive change. Implicit in logotherapy is the belief that other people matter, an area of particular interest to the positive psychologist, Christopher Peterson (e.g., Peterson, 2013). It is worth noting that “other people matter” can mean two different things. Firstly, other people can matter as instruments for our own happiness and well-being. Secondly, they can matter because we are relational and spiritual by nature and caring for others is simply an expression of our humanity. This is a difference of extrinsic versus intrinsic motivation. This subtle distinction reflects the clash of two fundamentally different value systems: Western society’s secular, individualistic and materialistic values versus the more traditional spiritual, collectivistic and humanistic values. These two different worldviews or value systems have important implications for both research and psychotherapy. Most of the current positive psychology research is predicated on the Western individualistic worldview. Most positive psychologists consider virtues and values to be a smorgasbord from which individuals decide their personal preferences. In contrast, Viktor Frankl considers the responsible use of freedom and self-transcendence to be fundamental values, essential for personal and communal well-being. In short, Frankl proposed a different positive vision for humanity and a different pathway to achieving it. Only future research can decide whether Frankl-Wong’s meaning-seeking model is equal to or better than the prevailing PERMA model (Seligman, 2012) in achieving flourishing, especially in developing countries and among the suffering masses. Frankl’s meaning-seeking model represents my attempt to systematically translate the basic assumptions of Frankl’s logotherapy into testable hypotheses. This paper emphasizes how meaning seeking is related to personal growth and well-being in both positive and negative situations. It provides a comprehensive conceptual framework for both enhancing one’s well-being and protecting one from the threat and harm of various negative forces in life. Much research has been done on the difference and relationship between meaning and happiness (e.g., Baumeister, Vohs, Aaker, & Garbinsky , in press; King, Hicks, Krull, & Del Gaiso, 2006). Frankl’s meaning-seeking model offers a unique perspective on happiness. More specifically, Frankl’s meaning-seeking model offers the following hypotheses: (1) The kind of happiness constitutive of meaning is eudaemonic (Waterman, 2008, 2013a) rather than hedonic (Kahneman, Diener, & Schwarz, 2003). (2) To pursue happiness directly may be counterproductive because authentic happiness will ensue only when we pursue and live a meaningful life. (3) The major difference between pursuing happiness as an end state and pursuing meaning reflects a fundamental difference in worldview, as I have discussed earlier. The pursuit of meaning may entail personal sacrifice and suffering for a worthy cause; however, in terms of the larger picture, such a pursuit yields a greater good and a higher level of satisfaction. The contemporary positive psychology of meaning, strength, virtue and well-being focuses on components of the good life that can be achieved through engaging in the proper activities (e.g., strengths-enhancing or happiness-inducing activities). In contrast to the cognitive behavioral focus of positive psychology, Viktor Frankl’s spiritual approach emphasizes being rather than doing. Although Frankl focuses on concrete action in concrete situations as a way of experiencing meaningfulness, he also emphasizes that our actions need to be consistent with logos or with the will to meaning that is situated in our spiritual core (the noetic dimension). Without any reference to the spiritual dimension of being human, the concrete world of action can still be meaningless. In taking a holistic and meaning-centered approach, we can avoid the issue of whether one character strength is better than another or whether the combination of two character strengths is better than one; to be a responsible and fully functioning human, one needs to develop all the virtues related to the spiritual core. Following this line of thought, we can predict that a positive education that focuses on developing personal responsibility, self-transcendence and the classical ideals of goodness, beauty and truth will produce better citizens than a strengths-based and happiness-oriented positive education. The existential perspective focuses on a particular way of being in a world that is full both of good things as well as suffering. Frankl puts less emphasis on doing certain things in order to live the good life, but more emphasis on fulfilling the will to meaning. In other words, he wants us to live out our spiritual nature of human beings by living a life of self-transcendence and responsibility—the touchstones of a spiritual being. Positive psychology emphasizes instrumental action as the best way to bring about positive change, whereas logotherapy emphasizes inner transformation and belief-based and spiritually-oriented action as the most efficacious way. Park’s (2010) meaning-making model focuses on the global belief in justice, benevolence and meaning. Janoff-Bulman (1989, 1992) focuses on the worldview of believing in justice, benevolence, self-worth, control and meaning. In order to experience post-traumatic growth, one has to restore a sense of meaning and comprehensibility as well as a sense of personal significance (Janoff-Bulman, 2004). In contrast, Frankl hypothesized a set of global beliefs that can accommodate the worst kinds of tragic situations. One key belief is his affirmation of the intrinsic value and meaning of life. This affirmation provides a foundation for hope in even the most devastating situations. 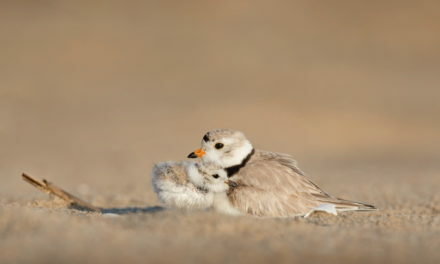 It is also important to note his belief that each life has intrinsic value because of the individual’s inherent singularity, unique calling in life and potential for growth; this belief provides the basis for a positive self-concept, regardless of setbacks and failures. Thus, Frankl’s assumption of the intrinsic meaning and value of life, in spite of the presence of injustice and maleficence, represents a balanced global belief, which readily accommodates the reality of suffering and evil. Such a belief makes it less likely to be shattered by traumas. Contemporary meaning-making models (e.g., Park, 2010) focus almost exclusively on the cognitive function of making sense of the world in negative situations. In contrast, Frankl’s meaning-seeking model focuses more on meaning seeking, in terms of how to live with courage, freedom and responsibility. Meaning seeking is primarily about how to live a life of significance and purpose, in addition to making sense of life and feeling happy. Park’s (2010) meaningfulness as part of global beliefs is the subjective sense of the meaning of one’s activity toward a desired goal. Thus, sense of meaning is not only an outcome measure, but also a part of global beliefs. 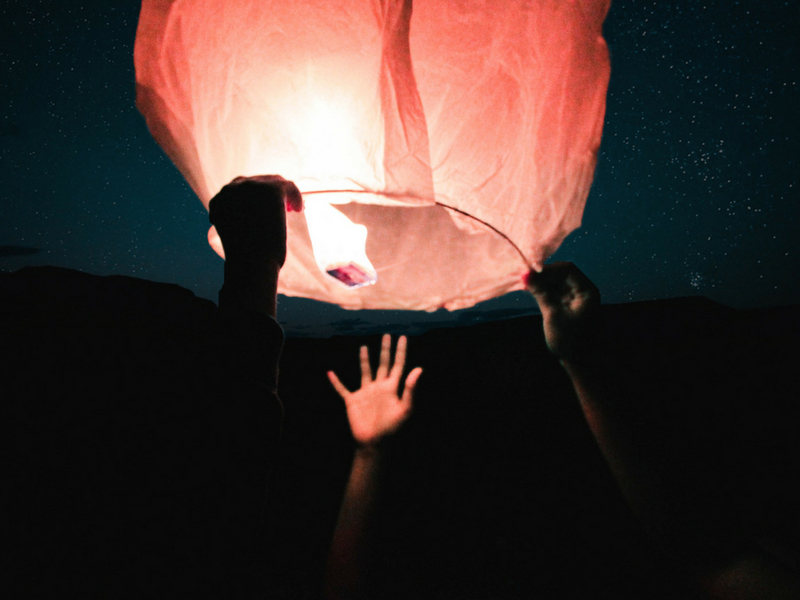 In Frankl’s model, the global belief of meaningfulness is rooted in the presuppositions that life has inherent meaning and that one’s life has unique meaningful goals, in addition to the life experience of engaging in the pursuit of meaning. A comprehensive theory of meaning, such as Wong’s Meaning Management Theory (2008), needs to include both meaning seeking and meaning making, with respect to both cognitive meaning and existential meaning. The constructivist view of meaning (Raskin, Bridges, & Neimeyer, 2010) represents another comprehensive framework of meaning seeking and meaning making. Ultimately, we need to arrive at some kind of general theory of meaning that integrates all three approaches: the cognitive behavioural approach, the existential approach and the constructivist approach. The International Meaning Conferences (see www.meaning.ca/conference) have held global summits on meaning, trying to achieve this kind of integration. We have not had much success in integrating different schools of thought, but that does not mean we should not continue the effort. Current research on spirituality favours the perspective of conceptualizing religiosity and spirituality as a system of meaning (Park, 2005, 2007; Wortmann & Park, 2009). This perspective is consistent with Frankl’s idea that situational meaning cannot be separated from ultimate meaning because global beliefs, especially religious/spiritual beliefs, guide the appraisal of situational meaning (Park, 2010; Wortmann & Park). The main difference is that, for Frankl, spirituality is not just part of one’s global beliefs; it is rooted in human nature as created by a Super-meaning or God. More specifically, he emphasizes that the spiritual or the noetic dimension is the basis of the global beliefs in ultimate meaning and self-transcendence. It is not meaningfulness that makes one spiritual; it is one’s spirituality that motivates one to seek and realize meaning. “The will to meaning” is probably Frankl’s most influential theoretical contribution to psychology. It is his way to speak to the deepest yearning of the human spirit and opens the gateway to the exploration of spirituality and the transcendental realm. According to Frankl, this spiritual desire cannot be fully satisfied by pleasure, power and material acquisitions; it can only be satisfied by losing ourselves to serving a higher purpose and a greater good. In sum, Frankl’s meaning-seeking model opens up new frontiers for positive psychology research and psychotherapy. This chapter highlights the value of combining philosophical insights with scientific rigor. This chapter is part of my overall plan to develop a general meaning-management theory that is comprised of meaning seeking, meaning making and meaning reconstruction. The 21st century, in some way, also experiences a meaning crisis similar to Frankl’s era. The increasing rates of random violence, depression and addiction form a neurotic triad that, according to logotherapy, is due to the existential vacuum or meaninglessness. Public education of the importance of meaning seeking, meaning making and personal responsibility can serve the dual objectives of preventing or healing mental illness and promoting well-being and flourishing. A meaning perspective shifts the focus away from the egotistic pursuit of happiness and success to a compassionate and spiritual worldview of serving a greater good. This shift to the meaning-mindset provides a better foundation for community mental health than the prevalent success-happiness mindset, which encourages cut-throat competition for personal happiness and success. Such pursuits inevitably will lead to discouragement, frustration and aggression. That being said, only systematic research can determine the benefits and limitations of Frankl’s meaning-seeking model. The latest incarnation of positive psychology (Kashdan & Ciarrochi, 2013), which attempts to integrate positive psychology and Acceptance and Commitment Therapy (ACT), gives me some hope about the future of dialogue between positive psychology and humanistic-existential psychology, even though recently Waterman (2013b) concluded otherwise. The present chapter is my latest attempt at such a dialogue, in addition to my earlier endeavours (e.g., Wong, 2009b; Wong, 2010b; Wong & Gingras, 2010). It is also worth noting that positive psychology represents the Western liberal idealism that is confident in the triumphant march of history toward a utopian vision of flourishing through scientific progress. It is optimistic that all the personal and social ills will fade away when we focus on strengths-enhancing and happiness-inducing activities to promote flourishing. Logotherapy, on the other hand, represents the Judeo-Christian idealism that is confident in the realization of a better world through an increase in personal responsibility, brotherly love and service to others. This idealism, however, is tempered by a dosage of the realism that comes from Frankl’s personal experiences of the horrors of the Holocaust. Frankl is less sanguine about the dark side of human nature than many positive psychologists. He insisted that if we do not believe in the intrinsic value of life and if we do not have the courage to stand up for what is right, there will always be the possibility of another Hitler. There are practical implications for these two different ideologies and idealisms. Positive psychology is more appealing to people in Western democracies, whereas logotherapy is more attractive to people who are struggling for freedom and justice, such as Martin Luther King Junior, in his civil rights movement and Nelson Mandela, in his fight against apartheid in South Africa. I believe that, in spite of the great divide in terms of assumptions and worldviews (see Table 1 for a summary), positive psychology can still benefit greatly from Frankl’s deep insights about human nature and human existence and logotherapy can also benefit from positive psychology’s rigorous research on meaning. It is easy to work with variables that can be easily quantified and measured within a simple conceptual model. But it is more rewarding and challenging to do research on constructs that are complex and do not readily lend themselves to experimentation and quantification. These methodological difficulties should not deter us from doing research on the hypotheses outlined earlier. I do not claim that Frankl is correct in all his assumptions, but I believe that his positive vision, as described in this chapter, has the heuristic value of generating interesting and important research. Only recently have we begun to see serious attempts to integrate logotherapy with positive psychology’s meaning research (e.g., Chetan, Marszalek, LaVerne, & Hinshaw, in press; Schulenberg, Baczwaski, & Buchanan, in press). The enduring appeal of Viktor Frankl, according to my assessment, consists of the passion of his conviction, the courage of his defiant spirit and his optimistic beliefs in the eventual triumph of love over hate, meaning over despair and good over evil. He makes the compelling case that, just as the stars cannot shine brightly without the darkness of the night, we cannot fully realize what is right about us without overcoming what is wrong with us. Another important implication of logotherapy is that we can make sense of all aspects of life only when we see ourselves as a part of the big picture, a grand narrative of creation, dehumanization, transformation and logo-actualization (meaning fulfillment). He has created a spiritually oriented positive psychology that transcends the tragedies of human existence and shows us a promising way to achieve the full potential of meaning-centered living and flourishing. Several years ago, I referred to Frankl as the “Prophet of Hope” (Wong, 2009a). Today, more than ever before, I still firmly believe that Frankl has offered us a bold vision of meaning and hope against a backdrop of chaos, uncertainty and dehumanization in a consumer society. His meaning-making model challenges us to new territories of research and interventions. To conclude this chapter, I want to quote one paragraph from Frankl’s (1985) Man’s Search for Meaning that indicates that decades ago he already realized that the domain of meaning in life was much broader in scope than most positive psychologists acknowledge. The author would like to thank Alexander Batthyany, Ph.D.; Marshall Lewis, Ph.D.; Edward Marshall, Ph.D., M.D. ; Thaddeus Metz, Ph.D.; and Stefan E. Schulenberg, Ph.D. for helpful comments on previous drafts of this manuscript. © Paul T. P. Wong, PhD. Please indicate how much you agree or disagree with each of the following statements by circling a number on the 5-point scale that best corresponds to your personal belief and attitude (1 strongly disagree, 2 disagree, 3 undecided, 4 agree, 5 strongly agree). Items 3, 4, 6, 8 and 10 are worded in the negative direction. The higher the total score is, the greater the meaning mindset. Originally published in Wong, P. T. P. (2012d). What is the Meaning Mindset? International Journal of Existential Psychology and Psychotherapy, 4(1), 1–3. Applebaum, A. J., Lichtenthal, W. G., Pessin, H. A., Radomski, J. N., Simay Gökbayrak, N., Katz, A. M., … Breitbart, W. (2012). Factors associated with attrition form a randomized controlled trial of meaning-centered group psychotherapy for patients with advanced cancer. Psycho-oncology, 21, 1195-1204. Baumeister, R. F. (1991). Meanings of life. New York, NY: Guilford. Batthyány, A. (2005). Der leidende Mensch. Medizin und Ideologie, 2(5). Batthyány, A. (2011). Over thirty-five years later: Research in logotherapy since 1975. New afterword to V. E. Frankl, Man’s search for meaning. London, UK: Rider. Batthyány, A., & Guttmann, D. (2005). Empirical research in logotherapy and meaning-oriented psychotherapy: An annotated bibliography. Phoenix, AZ: Zeig, Tucker & Theisen. Batthyány, A., & Levinson, J. (Eds.). (2009). Existential psychotherapy of meaning: A handbook of logotherapy and existential analysis. Phoenix, AZ: Zeig, Tucker & Theisen. Becker, E. (1962). The birth and death of meaning: A perspective in psychiatry and anthropology. New York, NY: Free Press of Glencoe. Bellah, R. N., Madsen, R., Sullivan, W. M., Swidler, A., & Tipton, S. M. (1985). Habits of the heart: Individualism and commitment in American life. Berkeley, CA: University of California Press. Breitbart, W., Rosenfeld, B., Gibson, C., Pessin, H., Poppito, S., Nelson, C., … Olden, M. (2010). Meaning-centered group therapy for patients with advanced cancer. Psycho-oncology, 19, 21-28. Burr, A., Santo, J. B., & Pushkar, D. (2011). Affective well-being in retirement: The influence of values, money, and health across three years. Journal of Happiness Studies, 12, 17-40. Chetan, J., Marszalek, J., LaVerne, B., & Hinshaw, A. (in press). An empirical investigation of Viktor Frankl’s logotherapeutic model. Journal of Humanistic Psychology. Christensen, C. M. (2012). How will you measure your life? New York, NY: HarperCollins. Cottingham, J. (2003). On the meaning of life. New York, NY: Psychology Press. Cottingham, J. (2008). The spiritual dimension: Religion, philosophy and human value. Ars Disputandi, 8, 1566-5399. Coward, D. D. (1996). Self-transcendence and correlates in a healthy population. Nursing Research, 45(2), 116-121. Coward, D. D., & Kahn, D. L. (2005). Transcending breast cancer: Making meaning from diagnosis and treatment. Journal of Holistic Journal, 23, 264-283. Coward, D. D., & Reed, P. G. (1996). Self-transcendence: A resource for healing at the end of life. Issues in Mental Health Nursing, 17(3), 275-288. Crumbaugh J. C. (1977). The Seeking of Noetic Goals Test (SONG): A complementary scale to the Purpose in Life Test (PIL). Journal of Clinical Psychology, 33, 900-907. Crumbaugh, J. C., & Maholick, L. T. (1964). An experimental study in existentialism: The psychometric approach to Frankl’s concept of noogenic neurosis. Journal of Clinical Psychology, 20, 200-207. D’Aquili, E. G., Rause, V., & Newberg, A. (2002). Why God won’t go away: Brain science and the biology of belief. New York, NY: Ballantine Books. Debats, D. L. (1998). Measurement of personal meaning: The psychometric properties of the Life Regard Index. In P. T. P. Wong & P. Fry (Eds. ), The human quest for meaning: A handbook of psychological research and clinical applications (pp. 111-140). Mahwah, NJ: Erlbaum. Deci, E. L., & Ryan, R. M. (1985). Intrinsic motivation and self-determination in human behavior. New York, NY: Plenum. Dik, B. J., Byrne, Z. S., & Steger, M. F. (Eds.). (2013). Purpose and meaning in the workplace. Washington, DC: American Psychological Association. Dik, B. J., & Duffy, R. D. (2009). Calling and vocation at work definitions and prospects for research and practice. The Counseling Psychologist, 37(3), 424-450. Dik, B. J., Duffy, R. D., & Eldridge, B. M. (2009). Calling and vocation in career counseling: Recommendations for promoting meaningful work. Professional Psychology: Research and Practice, 40(6), 625. Dobrow, S. R. (2006). Having a calling: A longitudinal study of young musicians. Cambridge, MA: Harvard University Press. Duffy, R. D., Allan, B. A., Autin, K. L., & Bott, E. M. (2013). Calling and life satisfaction: It’s not about having it, it’s about living it. Journal of Counseling Psychology, 60, 42-52. Ellermann, C. R., & Reed, P. G. (2001). Self-transcendence and depression in middle-aged adults, Western Journal of Nursing Research, 23, 698-713. Emmons, R. A. (2005). Striving for the sacred: Personal goals, life meaning, and religion. Journal of Social Issues, 61, 731-745. Emmons, R.A. (2006). Spirituality: Recent progress. In M. Csikszentmihalyi (Ed. ), A life worth living: Contributions to positive psychology (pp. 62-84). New York, NY: Oxford University Press. Fabry, J. (1995) Prescription for survival. International Forum for Logotherapy, 18, 7-12. Fabry, J. B. (1994). The pursuit of meaning (New revised ed.). Abilene, TX: Institute of Logotherapy Press. Forsyth, J. (2003). Psychological theories of religion. Upper Saddle River, NJ: Prentice Hall. Frankl, V. E. (1985). Man’s search for meaning (Revised and updated ed.). New York, NY: Washington Square Press. Frankl, V. E. (1986). The doctor and the soul: From psychotherapy to logotherapy (Revised and expanded ed.). New York, NY: Vintage Books. Fredrickson, B. L. (2001). The role of positive emotions in positive psychology: The broaden-and-build theory of positive emotions. American Psychologist, 56, 218. Fromm, E. (1956). The art of loving. New York, NY: Harper. Gable, S. L., & Haidt, J. (2005). What (and why) is positive psychology. Review of General Psychology, 9, 103-110. Graber, A. V. (2004). Viktor Frankl’s logotherapy: Method of choice in ecumenical pastoral psychology (2nd ed). Lima, OH: Wyndham Hall Press. Grouzet, F. M., Kasser, T., Ahuvia, A., Dols, J. M. F., Kim, Y., Lau, S., et al. (2005). The structure of goal contents across 15 cultures. Journal of Personality and Social Psychology, 89(5), 800. Hall, D. T., & Chandler, D. E. (2005). Psychological success: When the career is a calling. Journal of Organizational Behavior, 26(2), 155-176. Hardy, L. (1990). The fabric of this world: Inquiries into calling, career choice, and the design of human work. Grand Rapids, MI: Eerdmans. Haugan, G., Rannestad, T., Hammervold, R., Garåsen, H., & Espnes, G. A. (2013). Self‐transcendence in cognitively intact nursing‐home patients: A resource for well‐being. Journal of Advanced Nursing, 69, 1147–1160. Hicks, J. A., & Routledge, C. (Eds.). (2013). The experience of meaning in life: Classical perspectives, emerging themes, and controversies. New York, NY: Springer. Hoffman, E. (Ed.). (1996). Future visions: The unpublished papers of Abraham Maslow. Thousand Oaks, CA: Sage. Hunter, I., Dik, B. J., & Banning, J. H. (2010). College students’ perceptions of calling in work and life: A qualitative analysis. Journal of Vocational Behavior, 76(2), 178-186. Iwamoto, R., Yamawaki, N., & Sato, T. (2011). Increased self‐transcendence in patients with intractable diseases. Psychiatry and Clinical Neurosciences, 65(7), 638-647. Janoff-Bulman, R. (1989). Assumptive worlds and the stress of traumatic events: Applications of the schema construct. Social Cognition, 7(2), 113-136. Janoff-Bulman, R. (2004). Posttraumatic growth: Three explanatory models. Psychological Inquiry, 15(1), 30-34. Kahneman, D., Diener, E., & Schwarz, N. (2003). Well-being: The foundations of hedonic psychology. New York, NY: Russell Sage Foundation. Kashdan, T. B., & Ciarrochi, J. (2013). Mindfulness, acceptance, and positive psychology: The seven foundations of well-being. Oakland, CA: Context Press. King, L. A. (2012). Meaning: Ubiquitous and effortless. In P. R. Shaver & M. Mikulincer (Eds. ), Meaning, mortality, and choice: The social psychology of existential concerns (pp. 129-144). Washington, DC: American Psychological Association. King, L. A., Hicks, J. A., Krull, J. L., & Del Gaiso, A. K. (2006). Positive affect and the experience of meaning in life. Journal of Personality and Social Psychology, 90, 179-196. Latane, B., & Darley, J. M. (1970). The unresponsive bystander: Why doesn’t he help? New York, NY: Appleton-Century Crofts. Levy, N. (2005). Downshifting and meaning in life. Ratio, 18(2), 176-189. Luthans, F., Avolio, B. J., Avey, J. B., & Norman, S. M. (2007). Positive psychological capital: Measurement and relationship with performance and satisfaction. Personnel Psychology, 60(3), 541-572. Lyubomirsky, S. (2013). The myths of happiness: What should make you happy, but doesn’t, what shouldn’t make you happy, but does. New York, NY: Penguin Press. Markman, K. D., Proulx, T., & Lindberg, M. J. (Eds). (2013). The psychology of meaning. Washington, DC: American Psychological Association. Marshall, M., & Marshall, E. (2012). Logotherapy revisited: Review of the tenets of Viktor E. Frankl’s logotherapy. Ottawa, Canada: Createspace Independent Pub. Mascaro, N. (2006). Longitudinal analysis of the relationship of existential meaning with depression and hope. Doctoral Dissertation, Texas A&M University, College Station, Texas. Mascaro, N., & Rosen, D. H. (2008). Assessment of existential meaning and its longitudinal relations with depressive symptoms. Journal of Social and Clinical Psychology, 27(6), 576-599. Matthews, E. E., & Cook, P. F. (2008). Relationships among optimism, well‐being, self‐transcendence, coping, and social support in women during treatment for breast cancer. Psycho‐Oncology, 18(7), 716-726. McCarthy, V. L., & Bockweb, A. (2013). The role of transcendence in a holistic view of successful aging: A concept analysis and model of transcendence in maturation and aging. Journal of Holistic Nursing, 31, 93-94. Metz, T. (2011). The good, the true, and the beautiful: Toward a unified account of great meaning in life. Religious Studies, 47(04), 389-409. Metz, T. (2013). Meaning in life as the aim of psychotherapy: A hypothesis. In J. A. Hicks & C. Routledge (Eds. ), The experience of meaning in life: Classical perspectives, emerging themes, and controversies (ch. 30). New York, NY: Springer. Morgan, J., & Farsides, T. (2007). Measuring meaning in life. Journal of Happiness Studies, 10, 197-214. Newberg, A., & Waldman, M. R. (2007). Born to believe: God, science, and the origin of ordinary and extraordinary beliefs. New York, NY: Free Press. Novak, M. (1996). Business as a calling: Work and the examined life. New York, NY: Free Press. Nygren, B., Aléx, L., Jonsén, E., Gustafson, Y., Norberg, A., & Lundman, B. (2005). Resilience, sense of coherence, purpose in life and self-transcendence in relation to perceived physical and mental health among the oldest old. Aging & Mental Health, 9(4), 354-362. Paloutzian, R. F., & Ellison, C. (1982). Spiritual well-being scale. Nyack, NY. Pargament, K. I. (1997). The psychology of religion and coping. New York, NY: Guilford Press. Pargament, K. I., Magyar-Russell, G. M., & Murray-Swank, N. A. (2005). The sacred and the search for significance: Religion as a unique process. Journal of Social Issues, 61, 4, 665-687. Park, C. L. (2005). Religion as a meaning-making framework in coping with life stress. Journal of Social Issues, 61(4), 707-729. Park, C. L. (2007). Religiousness/spirituality and health: A meaning systems perspective. Journal of Behavioural Medicine, 30, 319-328. Park, C. L. (2010). Making sense of the meaning literature: An integrative review of meaning making and its effects on adjustment to stressful life events. Psychological Bulletin, 136(2), 257-301. Park, N., Park, M., & Peterson, C. (2010). When is the search for meaning related to life satisfaction? Applied Psychology: Health and Well-Being, 2, 1-13. Peterson, C. (2012, July). Meaning and mattering: Perspectives from positive psychology. Keynote lecture presented at the 7th Biennial International Meaning Conference, Toronto, Canada. Peterson, C. (2013). Pursuing the good life: 100 reflections in positive psychology. New York, NY: Oxford University Press. Peterson, C., & Seligman, M. E. P. (2004). Character strengths and virtues: A handbook and classification. New York, NY: Oxford University Press. Peterson, C., Ruch, W., Beermann, U., Park, N., & Seligman, M. E. P. (2007). Strengths of character, orientations to happiness, and life satisfaction. Journal of Positive Psychology, 2(3), 149-156. Proulx, T., & Inzlicht, M. (2012). The five “A”s of meaning maintenance: Finding meaning in the theories of sense-making. Psychological Inquiry, 23, 317-335. Raskin, J. D., Bridges, S. K., & Neimeyer, R. A. (Eds.). (2010). Studies in meaning 4: Constructivist perspectives on theory, practice, and social justice. New York, NY: Pace University Press. Reker, G. T., & Woo, L. C. (2011). Personal meaning orientations and psychosocial adaptation in older adults. SAGE Open, 1(1), 1-10. Runquist, J. J., & Reed, P. G. (2007). Self-transcendence and well-being in homeless adults. Journal of Holistic Nursing, 25, 1-13. Ryff, C. D. (1989). Happiness is everything, or is it? Explorations of the meaning of psychological well-being. Journal of Personality and Social Psychology, 57, 1069-1081. Schnell, T. (2009). The Sources of Meaning and Meaning in Life Questionnaire (SoMe): Relations to demographics and well-being. Journal of Positive Psychology, 4, 483-499. Schnell, T. (2010). Existential indifference: Another quality of meaning in life. Journal of Humanistic Psychology, 50(3), 351-373. Schulenberg, S. E. (2004). A psychometric investigation of logotherapy measures and the Outcome Questionnaire (OQ–45.2). North American Journal of Psychology, 6, 477-492. Schulenberg, S. E., Baczwaski, B. J., & Buchanan, E. M. (in press). Measuring search for meaning: A factor-analytic evaluation of the Seeking of Noetic Goals test (SONG). Journal of Happiness Studies. Schulenberg, S. E., & Melton, A. M. A. (2010). A confirmatory factor-analytic evaluation of the purpose in life test: Preliminary psychometric support for a replicable two-factor model. Journal of Happiness Studies, 11, 95-111. Schwartz, B. (2012). Choice, freedom, and autonomy. In P. R. Shaver & M. Mikulincer (Eds. ), Meaning, mortality, and choice: The social psychology of existential concerns (pp. 271-288). Washington, DC: American Psychological Association. Seligman, M. E. (1990). Learned optimism. New York, NY: Knopf. Seligman, M. E. P. (2002). Authentic happiness: Using the new positive psychology to realize your potential for lasting fulfillment. New York: Free Press/Simon & Schuster. Seppala, E. (2013). The compassionate mind: Science shows why it’s health and how it spreads. APS Observer, 26, 5. Retrieved from www.psychologicalscience.org/index.php/publications/observer/2013/may-june-13/the-compassionate-mind.html. Shaver, P. R. & Mikulincer, M. (Eds.). (2012). Meaning, mortality, and choice: The social psychology of existential concerns. Washington, DC: American Psychological Association. Sheldon, K. M., Kashdan, T. B., & Steger, M. F. (Eds.). (2011). Designing positive psychology: Taking stock and moving forward. New York, NY: Oxford University Press. Steger, M. F. (2012). Experiencing meaning in life: Optimal functioning at the nexus of well-being, psychopathology, and spirituality. In P. T. P. Wong (Ed. ), The human quest for meaning: Theories, research, and applications (2nd ed., pp. 164-184). New York, NY: Routledge. Steger, M. F., Frazier, P., Oishi, S., & Kaler, M. (2006). The Meaning in Life Questionnaire: Assessing the presence of and search for meaning in life. Journal of Counseling Psychology, 53, 80-93. Steger, M. F., Kashdan, T. B., & Oishi, S. (2008). Being good by doing good: Daily eudaimonic activity and well-being. Journal of Research in Personality, 42(1), 22-42. Steger, M. F., Kawabata, Y., Shimai, S., & Otake, K. (2008). The meaningful life in Japan and the United States: Levels and correlates of meaning in life. Journal of Research in Personality, 42, 660-678. Steger, M. F., Oishi, S., & Kashdan, T. B. (2009). Meaning in life across the life span: Levels and correlates of meaning in life from emerging adulthood to older adulthood. Journal of Positive Psychology, 4, 43-52. Steger, M. F., Sheline, K., Merriman, L., & Kashdan, T. B. (2013). Using the science of meaning to invigorate values-congruent, purpose-driven action. In T. B. Kashdan & J. Ciarrochi (Eds. ), Mindfulness, acceptance, and positive psychology: The seven foundations of well-being (pp. 240-266). Oakland, CA: Context Press. Taylor, S. E., Kemeny, M. E., Reed, G. M., Bower, J. E., & Gruenewald, T. L. (2000). Psychological resources, positive illusions, and health. American Psychologist, 55(1), 99. Waterman, A. S. (Ed.) (2013a). The best within us: Positive psychology perspectives on eudaimonia. Washington, DC: American Psychological Association. Waterman, A. S. (2013b). The humanistic psychology–positive psychology divide: Contrasts in philosophical foundations. American Psychologist, 68(3), 124-133. Wong, P. T. P. (1998). Implicit theories of meaningful life and the development of the Personal Meaning Profile (PMP). In P. T. P. Wong & P. Fry (Eds. ), The human quest for meaning: A handbook of psychological research and clinical applications (pp. 111-140). Mahwah, NJ: Erlbaum. Wong, P. T. P. (2009b). Existential positive psychology. In S. Lopez (Ed. ), Encyclopedia of positive psychology (Vol. 1, pp. 361-368). Oxford, UK: Wiley Blackwell. Wong, P. T. P. (2010a). Meaning therapy: An integrative and positive existential psychotherapy. Journal of Contemporary Psychotherapy, 40(2), 85-99. Wong, P. T. P. (2010b). What is existential positive psychology? International Journal of Existential Psychology and Psychotherapy, 3(1), 1-10. Wong, P. T. P. (Ed.). (2012a). The human quest for meaning: Theories, research, and applications (2nd ed.). New York, NY: Routledge. Wong, P. T. P. (2012b). From logotherapy to meaning-centered counseling and therapy. In P. T. P. Wong (Ed. ), The human quest for meaning: Theories, research, and applications (2nd ed., pp. 619-647). New York, NY: Routledge. Wong, P. T. P. (2012c). Introduction: A roadmap for meaning research and applications. In P. T. P. Wong (Ed. ), The human quest for meaning: Theories, research, and applications (2nd ed., pp. xxvii-xliv). New York, NY: Routledge. Wong, P.T.P. (2012d). What is the meaning mindset? International Journal of Existential Psychology and Psychotherapy, 4(1), 1-3. Wong, P. T. P., Reker, G. T. & Peacock, E. (2006). The resource-congruence model of coping and the development of the Coping Schema Inventory. In P. T. P. Wong, & L. C. J., Wong (Eds. ), Handbook of multicultural perspectives on stress and coping (pp. 223-283). New York, NY: Springer. Wong, L. C. J., Thompson, G. R., & Wong, P. T. P. (Eds.) (2013). The positive psychology of meaning and addiction recovery. Birmingham, AL: Purpose Research. Wong, P. T. P., & Wong, L. C. J. (2012) A meaning-centered approach to building youth resilience. In P. T. P. Wong (Ed. ), The human quest for meaning: Theories, research, and applications (2nd ed., pp. 585-617). New York, NY: Routledge. Wortmann, J. H., & Park, C. L. (2009). Religion/spirituality and change in meaning after bereavement: Qualitative evidence for the meaning making model. Journal of Loss and Trauma, 14, 17-34. Wrzesniewski, A., & Dutton, J. E. (2001). Crafting a job: Revisioning employees as active crafters of their work. Academy of Management Review, 26, 179-201. Wong, P. T. P. (2014). Viktor Frankl’s meaning seeking model and positive psychology. In A. Batthyany & P. Russo-Netzer (Eds. ), Meaning in existential and positive psychology (pp. 149-184). New York, NY: Springer.